Sir Barnet Stross, Stoke-on-Trent, by whom purchased from the artist, probably in 1938 and by descent to the previous owner. Anonymous sale: Sotheby's, London, 1 December 1999, lot 42, where purchased by the present owner. 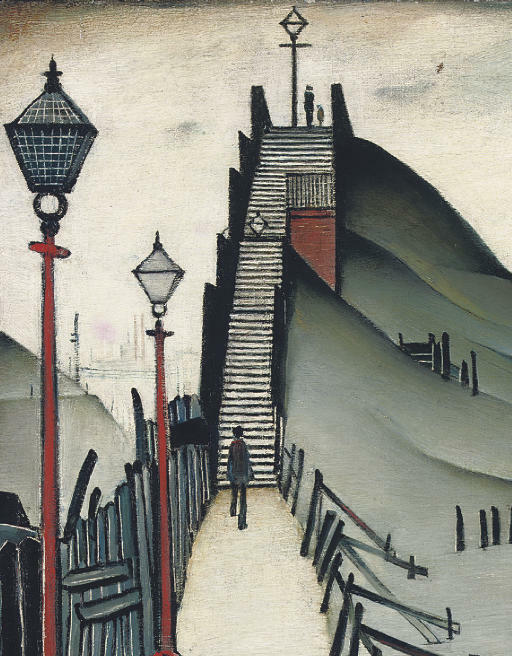 Painted in 1938 A Footbridge demonstrates Lowry's extraordinary skill as a painter. The 1930s were a particularly difficult decade for Lowry as his father had died in 1932 leaving him to look after his bed-ridden mother who was prone to neurosis and depression (see also note to lot 127) and many of his works of this period reflect the stress and isolation that he felt. Michael Howard comments, 'Lowry, as far as is known, and for understandable reasons, produced relatively little in the late Thirties, and if his urban scenes of the mid-decade are among some of his most accessible images of inner-city life, the latter part of the decade saw the production of two of his most sombre canvases, The Landmark (1936) and The Lake (1937), and also his so-called 'grotesque heads'. From this point on, although one should be wary of over-schematising an artist's career, Lowry's art becomes a continuing meditation on certain fundamental themes, driven by his belief that the world of appearances could be used to express symbolically his own inner states' (see Lowry: A Visionary Artist, Salford, 2000, p. 211). The present work relates to Lowry's industrial paintings as, in the background, factories with smoking chimneys are visible, however, the painting has the feel of his 'lonely landscapes' with the green slopes rising up to meet the bridge. The solitary figure, approaching the bottom of the steps, reinforces the theme of isolation that imbue these type of paintings and this is echoed by the lamp posts that appear along the path. The orginal owner of the present work, Sir Barnet Stross, was a G.P. in Stoke-on-Trent and practised as a specialist in industrial diseases. He later went on to become Labour M.P. for Stoke and parliamentary Health Secretary, and was, throughout his life, a great patron of the arts. At the same time as acting as patron to Lowry, Sir Barnett was a keen supporter of Sickert, Roberts and Epstein during the 1930s. Lowry also depicted the same subject matter in pencil circa 1935, illustrated in M. Howard, Lowry: A Visionary Artist, Salford, 2000, p. 46 and S. Rohde, L S Lowry: a life, London, 2007, p. 89 (see fig. 1).